Found in FNA Volume 8. Treatment on page 499. Mentioned on page 370, 376. Shrubs or trees. Stems erect; twigs glabrous. Leaves persistent; blade ovate, coriaceous, margins entire or serrate, plane, surfaces often multicellular, long-stalked stipitate-glandular-hairy, otherwise unicellular-hairy on midvein [covering abaxial surface]; venation reticulodromous (reticulum rather dense and with all orders ± equally prominent). Inflorescences axillary [terminal] racemes [panicles], 10–20-flowered, (produced just before flowering). Pedicels: bracteoles 2, near base to ± midpoint. Flowers: sepals 5, slightly connate, deltate; petals 5, connate for most of their lengths, white [red], corolla cylindric [urceolate], lobes short; stamens 10, included; filaments geniculate, flattened, hairy, without spurs; anthers without awns, dehiscent by elliptic pores; pistil 5-carpellate; ovary 5-locular; stigma (slightly exserted), truncate to capitate, obscurely lobed, (minutely papillose). Fruits capsular, subglobose to short-ovoid, (with unthickened sutures), dry. Seeds 120–250, narrowly oblong to pyramidal or angular-obovoid; testa cells elongate. x = 12.
se United States, Mexico, Central America, South America, Africa, Indian Ocean Islands (including Madagascar). Species 31 (1 in the flora). Judd, W. S. 1984. 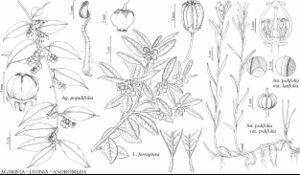 A taxonomic revision of the American species of Agarista (Ericaceae). J. Arnold Arbor. 65: 255–342.